Not more than a few generations. And if you look at all things that have become white over the past century, one by one they are regaining their color. White bread, white pasta, white flour, white sugar, white rice are now recognized as more or less empty calories and are being replaced by their whole counterparts, on the brown to black side of the color spectrum. It is time for idlis to do the same. Black Gram (Urad): Soaked and ready to burst out of its skin! 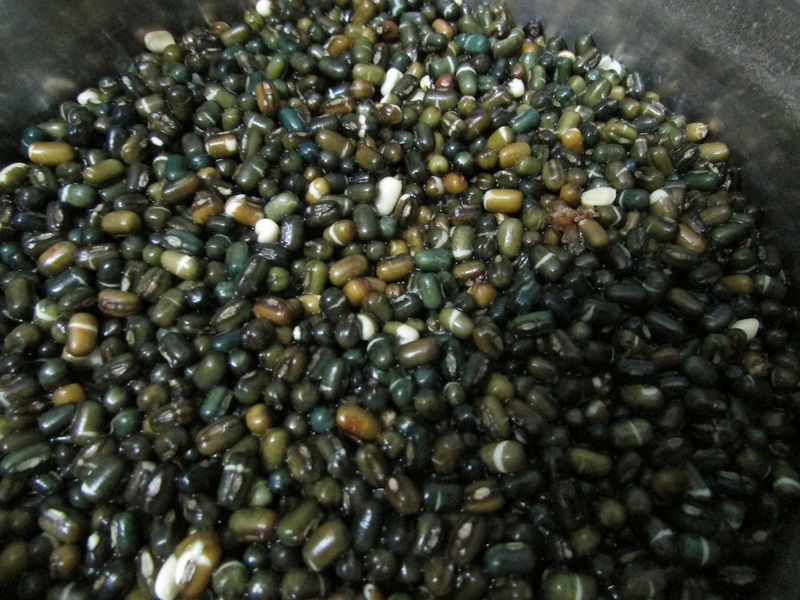 Urad or Black Gram attracts wild yeast from the air. As it ferments, the yeast makes the batter rise. What are idlis made of? Black gram and rice. Or black gram and millets. (In some languages, millets are termed as varieties of rice.) Whatever the rice or millet, the legume is black gram, whole or split. Called urad (उरद) or minuvulu (మినువులు) or minugulu (మినుగులు) in their whole form or urad dal (उरद दाल) or minapappu (మినపప్పు) in their split form, this legume is what gives idlis their rise. Soaked, ground and fermented, it attracts wild yeast from the air and nourishes it in the batter. Rice can be any shade from light brown to a vague red, but unless you remove the husk, bran and germ, it is not white. Black gram is obviously black. Unless you remove the skin. Equal parts of kodo millet, rice and urad dal. Removing the skin removes bran and vital nutrients as well as our connection to our color and to the source of our energy. White food is considered “refined” with its implications of being fashionable, elite, fair and lovely. Unlike the coarse, fibrous whole grain or whole legume with its nutrients intact and slowly absorbed over several hours, white food signals leisure and delicacy. Brain, so to speak, over brawn. I was alerted to this cultural significance of white food at a temple in Boston where in my wide-eyed enthusiasm I suggested that we use brown rice for preparing the naivedyam (offering). “Brown rice,” I was told “is for labour.” The sentiment is echoed by several of my relatives when I offer them idli and dosa which are naturally brown whenever I make them. “We used to eat these at my grandparents’ house,” one would say, “when we were going out to work on the farm.” Their tone made clear that those days were passé. Dosa made of amaranth, rice and urad dal. It is of course an irony that while the extra processing required to make foods white may have initially made them more expensive, today white foods are cheaper than whole grain. There are several reasons for this: the food industry uses the husk and bran for other products, and for animal feed. Refined grain prolongs shelf life of packaged foods and also allows for the factory-produced flavoring agents to take effect without the texture and flavor of the whole grain interfering. Because the industry is interested in promoting white foods, the mills are set up to provide polished grains at a large scale and even in the villages when we ask for brown rice the mill owners are often unwilling to comply or charge rates beyond the reach even of the more well to do villagers. In a city such as Mumbai, for example, brown rice costs Rs. 50-90 per kg, while white rice ranges from Rs. 20 – 80, and even more for basmati rice. Coarse grains such as millet, jowar and bajra are also moving up in price as they are discovered by those concerned with personal health as well as livelihood security of farmers and food security for all. The challenge is to ensure that these grains remain affordable to those who have sustained them over generations. Today those who eat whole grains are likely to come from two groups: people from remote rural and tribal areas that have not yet converted to refined and processed foods, or health-conscious urban consumers who are turning away from the white foods promoted to their parents or grandparents, to the whole and diverse foods familiar to their great-grandparents. Two paths are available to us: let the hype of whiteness penetrate to every remote and rural hamlet till the only ones eating whole grains and dark-skinned foods are the elite and the price goes up accordingly. Or: let the appreciation of whole foods and all colors reach the majority from the rural and tribal areas that are not so remote, to the semi urban and urban populations, while the elders in the family may still be alive to remember that they did eat these in their youth. Pour the same batter into a waffle iron and voilà! dosa waffle! So there you have it folks. All kinds of idlis. Dosas too! 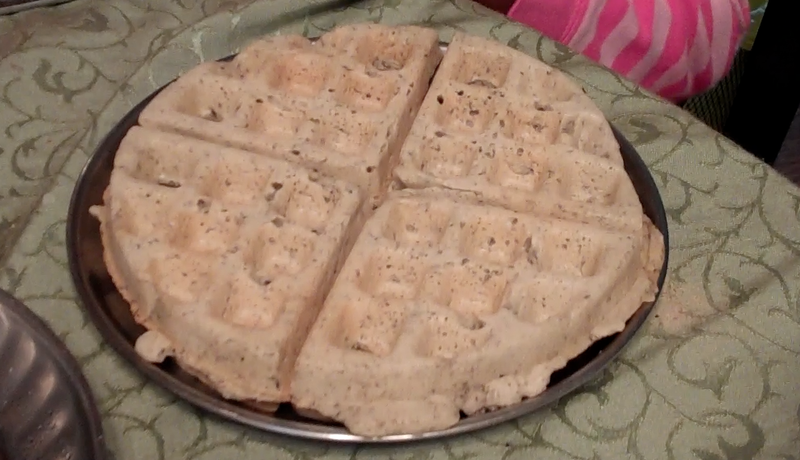 You can pour the same batter into a waffle iron as well. Remember to use black gram that is black, that is, whole urad or unpeeled split urad. Previous Who says money doesn’t grow on trees?